Data security is one of the main concerns of organizations and institutes that use the OMR software to process the OMR answer sheets. Although the OMR software processes the sheets quite fast, the data stays inside the system only for some time. Due to this, there is not much time to manipulate the sheets. However, this becomes crucial when the answer sheets are of competitive examinations like entrance and recruitment tests. As these tests have a large number of participants, the evaluation staff is in contact with the OMR data for a longer time, which increases the chances of manipulation. Hence, taking security measures is a must. It is possible to protect the OMR software with a password. Two types of passwords are available: user password and administrator password. The administrator password cannot be accessed by everyone and thus prevents the user from viewing as well as changing the answer key. The results or information derived from the OMR sheets can also be protected with the password. On the other hand, if you are using server based OMR, that data between the OMR terminal and server is transferred in the OMR format. The OMR software compares the scanned OMR sheets with the answer key fed into the system. If the answer key is fed into the software beforehand, the evaluation staff would know the right answers and can try to change the answers in some sheets. To avoid this, it is best to upload the answer key at the last minute, right before starting the OMR sheet checking process. This way, it is possible to prevent any kind of malpractice. Is it possible to alter the data after evaluation? Yes, it is possible to alter the data of the OMR answer sheet after being evaluated. However, Addmen provides you with the option of securing it with a password. The administrator is provided with a password; this has to be used to make any changes to the data. 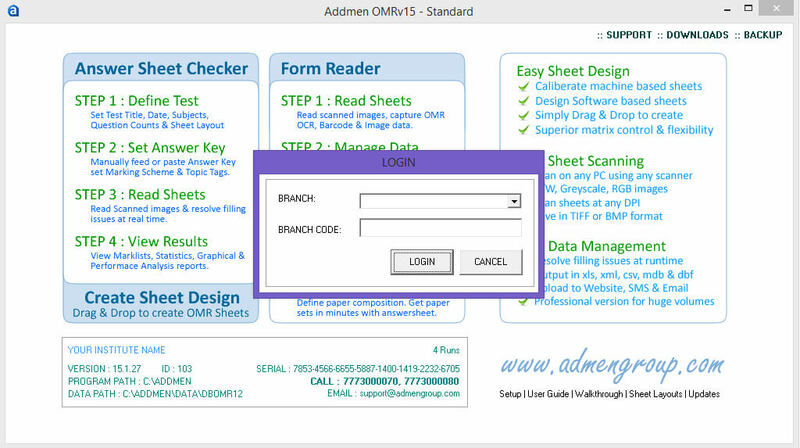 In short, securing the OMR data is possible with Addmen's OMR software.